Forget backpacker horror stories, Michelle Tchea discovers how hostels are stepping up their game and catering to the luxury traveller. If you thought luxury travel and hostels could not co-exist, think again. Call it a trend or perhaps a ‘disruption’ in the hotel industry, aided by the rise of the digital nomad, a new breed of hostels is demystifying stereotypes of living thrifty, and giving budget-conscious travellers a chance to indulge in hotel perks for hostel prices. Think designer furniture, technology-driven amenities and a private suite with a flat-screen TV and. Imagine a rooftop pool with views of Hollywood, a spa and wellness centre overlooking the Swiss Alps and even a stargazing chalet in the middle of Scotland. And all for some loose change. Here are some of the best luxury-inspired hostels to help you plan your next holiday destination. The grand exterior of the beach retreat. Yoga-junkies and surf-heads, this one is for you. If you thought yoga retreats came with a hefty credit card bill, venture over to the golden bays of Cascais in Portugal and stay at The Salty Pelican. Created by three backpackers and powered by well-known surf brands Roxy and Quiksilver, expect everything you love in an expensive yoga retreat but for a fraction of the price. Opt for a variety of packages, including the seven-night surf and yoga package from $753 in low season, or simply kick back and relax for a few nights on the cheap: its dorm rooms start at $30 per night and private rooms overlooking the sea from $155. With free wi-fi and daily buffet breakfast, it’s a haven for beachgoers on a tight-budget. 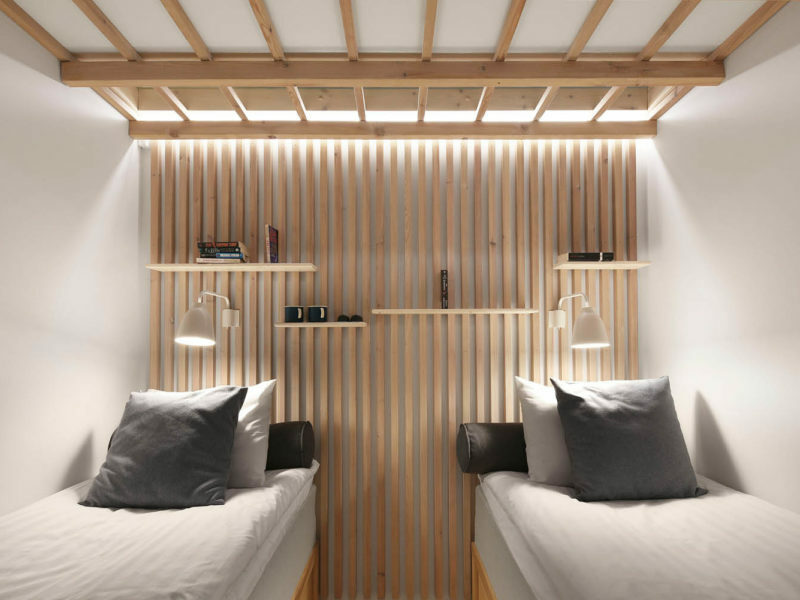 TOC Barcelona puts trendy Japanese pod hotels to shame. A unique hostel in the heart of Barcelona with designer furniture and excellent hotel-like amenities. There is a terrace with a swimming pool, as well as free wi-fi, bar, kitchen, game zone and technology-charged rooms. Just one of the stylish common area of the TOC Barcelona, Spain. Double superior suites come with private terraces and panoramic views of the city from $120 per night; shared rooms start from $47 a night. With Freehand in Los Angeles, you can see the city of stars on a budget. Live it up like an A-list celebrity in downtown L.A., with spacious suites and upscale shared rooms which do not look like regular bunk rooms at all, thanks to local designers Roman & Williams. The private loft and largest suite, Burroughs Suite, are extremely spacious and equipped with free wi-fi, retro cinematic furnishings and a giant LED television. There are four bars and eateries to choose from: don’t leave without enjoying a cocktail at the Broken Shaker, located next to the rooftop pool deck. The famous rooftop pool, Freehand, Los Angeles. Rooms start at $86 a night. If you ever dreamed of a white Christmas and wanted to do it in style – Switzerland would be the first choice, right? Rather than breaking your budget in St. Moritz or Montreux, give your wallet a break and visit WellnessHostel4000 in Saas-Fee. The contemporary architecture and high-quality upscale Swiss amenities – which include fitness centre, spa and award-winning restaurant – leave other hostels in the dust. A Finnish sauna, bio-soft sauna and whirlpool are just the beginning of the relaxation and wellness facilities on offer in this state-of-the-art hostel. You might not even feel inclined to leave the hostel and hit the slopes. Chic and simple digs at the WellnessHostel4000, Saas-Fee, Switzerland. Rooms from $100 per night. The grand bunks of the Grand Ferdinand, Vienna, Austria. Spread out over seven floors, the Grand Ferdinand’s 188 rooms range from opulent suites to elegant single rooms but the pièce de résistance is the hostel-like rooms attached to the historical hotel. The eight-bed dorm room is decked out in rich mahogany and marble. Rooms start at $45 per night: affordable luxury comes easily for Grand Ferdinand guests. At your doorstep are all the museums, monuments and coffee houses of Vienna’s old town, as well as the leafy Stadtpark and its golden Johann Strauss memorial. Bookings for the dorm rooms are available via Airbnb. Inside the common area of the Generator Hostel in Hamburg, Germany. A powerhouse of a chain, the Generator Hostels group is known for its one-of-a-kind hostels in cities typically populated with expensive hotels. 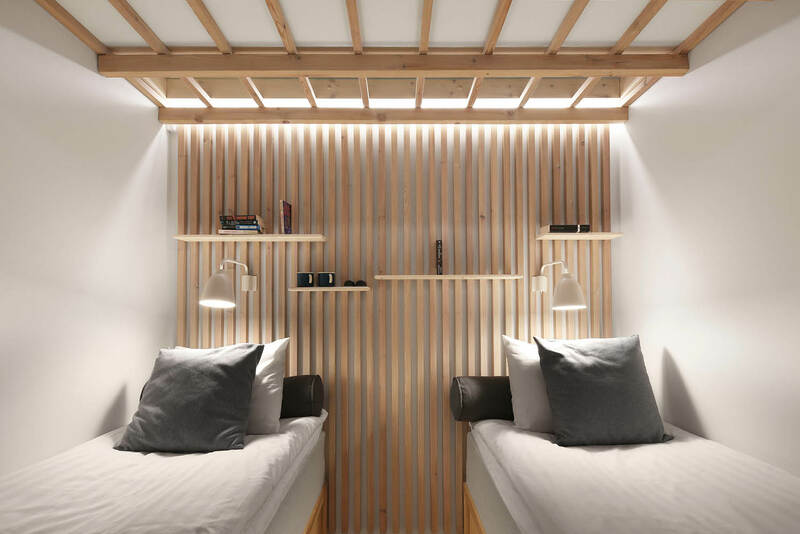 In Paris, one of the newest Generator Hostels is located in the hip 10th Arrondissement and gives travellers a stylish Parisian escape without breaking the bank. The stylish bunks at the Generator Hostel in Venice. Close to the art galleries of Canal Saint-Martin, the hostel has its own rooftop bar that overlooks the trendy Montmartre neighbourhood as well as a notable restaurant, Café Fabien, to entice hungry travellers after a day spent exploring Paris. Inside one of the rooms at the Generator Hostel in Rome. The private suites are spacious and come with a terrace and hammock, but the shared dorm rooms are a bargain and not to be scoffed at, starting at $27 a night. Breakfast is served. Dream Hostel, Tampere, Finland. If you thought you could not see Finland on a budget, consider your dream reborn at Dream Hostel. The hostel is attached to a hotel but if you want to save a couple of dollars, the cheaper hostel rooms are equally delightful. A warm Scandinavian design resonates throughout the hostel and the perks of free wi-fi and free dinners on occasion make it more than ample for the average traveller. Bunks start at just $36 a night. Berlin has some really great upscale hostels but if you are looking for something truly spectacular, check into PLUS Hostel Berlin. The rooftop bar and a variety of wellness options, which include yoga classes, are great for travellers with lots of energy. But it’s the glittering swimming pool that sets this hostel apart from the rest. All rooms come with their own private bathroom and the restaurant, Opera, serves excellent cocktails to wrap up a great stay. The incredible pool inside PLUS Hostel in Berlin, Germany. Dorm rooms start at just $24 a night. Consistently voted as one of the best hostels in the world, Star Hostel Taipei is known for its clean setting and designer-vibe within a rather bustling and gritty city. Free breakfast, tea and wi-fi are great calling cards but the Scandinavian minimalistic feel to the cosy rooms make it a hostel worth staying in. Wooden timber panels encase an urban garden which doubles as a social hub. The private suites are worth splurging on for some extra privacy, and don’t forget to book yourself a bubble tea making class in the hostel to feel right at home. Cosy, interesting sleeping suites at Star Hostel Taipei, Taiwan. Dorm rooms start from $30. If you find yourself in the middle of the Cuillin mountain range located on the Isle of Skye in Scotland, do yourself a favour and stay in the Skyewalker Hostel. Private suites come in the form of Jedi Huts where you have your own private oasis in a wooden cabin to experience a full glamping experience. The glass solar-dome is a favourite, with excellent views of the night-sky. The hostel is within reach of a whisky distillery, sea eagle-spotting and access to the exhilarating Cuillin mountain range for avid and experienced hikers. The famous glass dome; a popular hangout for guests of the Skyewalker Hostel, Isle of Skye, Scotland. Dorm rooms start from $30 per night.